New month, new results. Here’s our choice for top eFlyer for the month of June and why we think they performed so well. Please email us at connect@thebdx.com with any comments. Subject Line: Bring Your Clients to our Meet the Builder Event Saturday June 9th! A very classy design is one on the main characteristic for Toll Brothers e-flyers, the photo is a good reference on how the houses may look like. It’s always important to highlight the RSVP like Irvine does, also the date and hour if will be an event. Subject Line: Phase 3 Homes at Summerfield Now Selling! Give the agents an update on how the communities are selling is always a good strategy, so they can move forward with more sales as Century does. 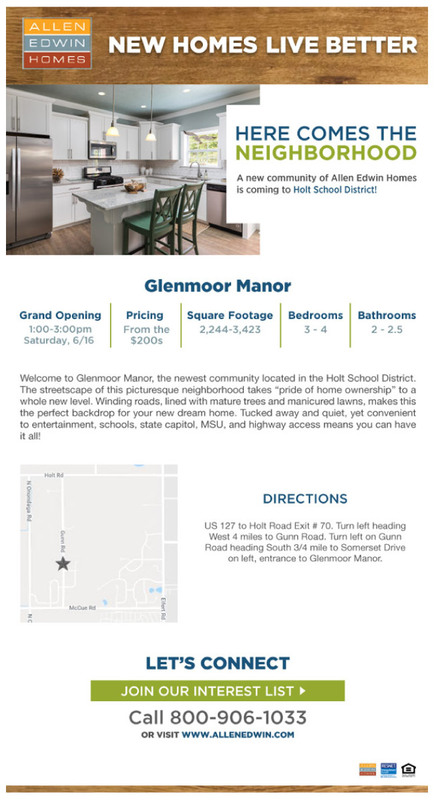 Subject Line: Tomorrow: New Community in Holt Schools! The header is the most important part of your eFlyer. The image and text on it will invite your client to rather read more/click on your eflyer or disregard it. LGI simplifies it with a great choice for the futured home and an invitation to the event.